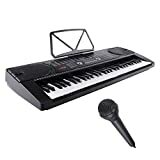 The primary purpose of our article is to serve as an in-depth review of the Alesis Recital 88 key beginner digital piano. Our review is going to focus on the product’s main features, its pros, and its cons. We will also attempt to summarize users’ opinions in an effort to help you make an informed purchasing decision by the end of the article. One of the very first things you will notice about the Alesis Recital 88 key beginner digital piano is its streamlined design. Looking at the face of the piano, you will find that the keys are laid out in such a way as to be both easy to use and understand. On the left-hand side of the keyboard is where the main power button is located and the master volume control knob. More towards the center is where the metronome and chorus functions are located. As for the miscellaneous voice settings, users can access these features via push-button controls all the way on the right side of the piano. Overall, we feel that the controls are ideal for both young users and older individuals who prefer a less complicated control layout. In most cases, new users should be able to acclimate to the various controls in an hour or less. This is definitely one of the main selling points of the product that beginners will particularly enjoy. The Alesis Recital 88 key beginner digital piano also comes with a wide range of educational features as well. For starters, there is a metronome feature built into the keyboard that supports multiple tempo modes. This is a great asset for users who are just starting to learn how to play and people who just need a bit of help mastering a new piece of music. Moreover, there is a feature, Lesson Mode, as well. In Lesson Mode, the keyboard gets divided into two sections. Each section plays the same pitch and voice. Using this mode, the teacher can play along with their student, and the student can hear whenever they make a mistake while practicing. It’s another one of the main features that make this product an ideal choice for beginners. 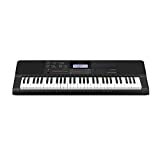 The Alesis Recital 88 key beginner digital piano also includes several additional features that are worth mentioning as well. For starters, the keys are semi-weighted. As a result, this keyboard provides a more accurate touch response that closely resembles that of a traditional piano. We also love that there is a MIDI output located on the back of the piano that connects to your favorite desktop or laptop easily. Once connected, you can take advantage of a wide range of educational tools and resources like Skoove to expand the educational capabilities of the product. 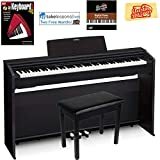 Semi-Weighted Key Design: Thanks to the semi-weighted keys, the Alesis Recital 88 key beginner digital piano closely resembles the feel of a traditional piano. Sound Quality: While the speakers performed admirably well in small and medium-sized rooms, you will need to invest in a high-quality external speaker to get the most out of larger rooms. Power Supply Versatility: For on the go operation, this electric piano can be operated via six D size batteries. If you prefer more continuous operation, you can easily switch to the included power adapter for uninterrupted fun. Voice Count: One area where the Alesis Recital 88 key beginner digital piano falls flat is the total voice count. In total, there are only five different voices to choose from. 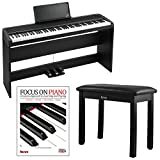 Educational Resources: One of the best things about the Alesis Recital 88 key beginner digital piano is the wide range of educational resources it includes. Some examples are the metronome feature, Lesson Mode, and the MIDI software compatibility. No Digital Display: Although not a deal breaker on its own, the lack of a digital display makes it a bit harder to use features like the metronome. However, this is fairly common for digital pianos in this particular price range. Polyphony Count: This electronic keyboard boast an impressive 128 polyphony count. This dramatically expands the range of pieces you can play. Such a feature is quite impressive considering the low purchase price of the product. For the most part, users seem to be quite happy with their new Alesis Recital 88 key beginner digital piano. One of the main compliments we see is that users love how easy the keyboard is to set up. They claimed that they had an easy time playing music on it from day one. Another positive note that most users can agree on is that this digital piano is a great choice for young artists. Those who are transitioning back and forth to a full-sized traditional piano regularly will find this useful. For many of the users, they opted for this product to provide their children with an option to practice at home. The Alesis model doesn’t take up much space either. However, there were one or two complaints as well. The first issue that we commonly noticed is that users wish there were more supported voices. However, we somewhat expected this due to the low purchase price of the product. Another issue some users have had is that the speaker output is not loud enough for large areas. 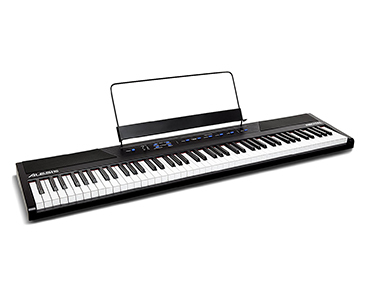 All in all, the Alesis 88 key beginner digital piano has a lot to offer. For starters, it features a low purchase price and is an ideal pick for users on a budget. We also love that it includes several educational tools. These are perfect for learning to play for the first time too. For those of you who have already tried this product, we would love to share your experiences in the comments area.